Image Transfer Review: It was certainly appropriate for the work of a visual stylist like Nicolas Roeg to be in Criterion's first wave of high-definition releases. The transfer is quite clean and no significant damage is visible. Colors are vivid throughout, and black levels are quite acceptable, with plenty of shadow detail. The down side is the pointless filtering all too common with AVC compression, which eradicates a lot of fine detail on medium and longer shots. There also seems to be some digital noise reduction at play, since in the opening sequence grasses vanish and reappear. Texture is generally pretty good, though the cityscapes come off better than the shots of countryside. The dying planet comes across very well, however. Audio Transfer Review: The PCM stereo audio transfer is equally clean, with decent range for a mid-1970s film, though it's not overwhelming in the bass department. Dialogue is clear throughout. Some of the source music sounds rather tinny, though that may well be by design; the soundtrack elements have excellent presence and immediacy. Extras Review: Criterion packs this release with extras, and they're all quite worthwhile, though this version omits the original 1963 novel by Walter Tevis included in the standard DVD. A substantial booklet includes credits and several essays regarding the picture and its importance. 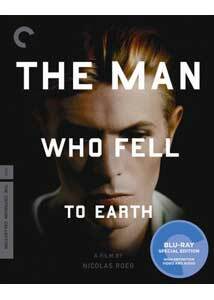 The feature also includes a full-length commentary from Roeg and Bowie (recorded in 1982) and Henry (recorded within the last year or so), edited together. They cover many different aspects of the production, and it's endlessly fascinating listening. The rest of the extras are quite solid as well (though none are presented in HD), starting with a 2005 interview with scriptwriter Paul Mayersberg (26m:15s) that covers the problems of adapting the novel to the film, including the choices of excision and addition to meet Roeg's vision. Candy Clark and Rip Torn also address the film in a 24m:49s interview segment, recognizing the film's importance and the quality of Roeg's work. Tevis (who died over a decade ago) is present in an audio interview from Book Beat in 1984, which covers his career, life as a writer, his personal problems and alienation as a unifying theme. On the production side, there are lengthy audio interviews with production designers Brian Eatwell (23m:36s) and his now wife May Routh, who designed the costumes (19m:36s), Their interviews are accompanied by illustrative clips, stills and sketches, giving an instructive visual tour in many elements that contribute to the overall feel of the film even though they might not be immediately noticeable. Seven trailers and teasers from the US and UK are present (including a legendary one narrated by William Shatner). Finally, there's a substantial gallery of stills, snapshots, and posters, as well as the collage-like continuity book used by Roeg in making the film. One of the classic films of the 1970s, with a distinctive visual style and some great central performances, comes packed with many significant extras. Highly recommended.